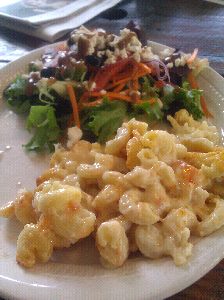 This is the real, real thing: Vermont cheddar macaroni and cheese at the Newfane Creamery in Newfane, near Brattleboro in southern Vermont. One of my regular stops when I'm in this part of New England. Yummy. That looks AMAZING! Thanks for sharing. Amanda's lettuce wrap hummus "tacos"